Al Zorah is a beautiful new destination within Ajman that sits nestled within 246 acres of rich ecological wetland – it’s perfect for ultimate relaxation, mangrove kayaking and bird watching, as it’s home to almost sixty different species of birds and marine life including native protected pink flamingos. 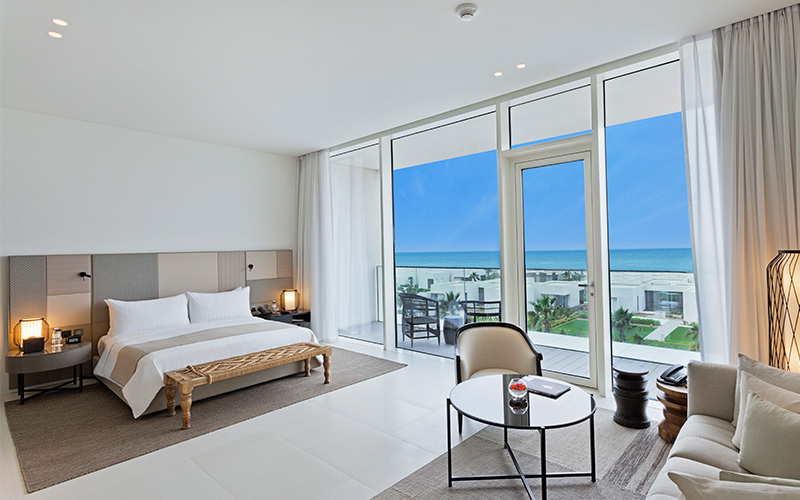 With beachfront views, The Oberoi Beach Resort, Al Zorah embraces the essence of its surroundings, with gorgeous, sophisticated design that marries nature with the contemporary. Far removed for the hustle and bustle of city life, the resort makes for a perfect weekend escape. Not only is the destination relaxing (complete with on-site Spa with a range of treatments, hammam and massage therapies), but it offers options for those looking for a bit of activity too. Within the Al Zorah community, you’ll find an 18-hole Championship golf course designed by Nicklaus Design, a marina, retail shopping, restaurants, and water sports facilities offering stand-up paddle boarding, canoeing, wakeboarding and more. Within the resort, choose from a range of spacious rooms and suites with private terraces, or a large villa with private, temperature-controlled pools, which are perfect for families. When it comes to dining, various options are available at The Oberoi Beach Resort, Al Zorah. Choose between the signature all-day fine dining venue, Vinesse, and Aquario, a lovely seafood restaurant that overlooks the beach. There’s also in-room dining and for those staying in villas, options include a private in-villa BBQ, set-up by a personal chef on the terrace. Head to Vinesse for breakfast and delight in a wide-range of buffet options, from baked pastries to freshly cut fruits, plus a la carte options including eggs benedict and waffles. During dinner, go a la carte with an international menu that caters to all tastes and preferences, with dishes from India to Japan. The burrata with cherry tomatoes, followed by the ribeye and incredibly moorish sticky toffee pudding to finish are all highly recommended. At Aquario, don’t miss the Heirloom tomato salad to start, followed by the grilled sea bass fillets with steamed vegetables and lemon beurre blanc drizzled on top – it’s a delight to enjoy whilst watching the gentle waves crash upon the shore in front – a truly relaxing dining experience. Once you’re well-fed, head to the resort’s stunning 85-metre long swimming pool, where you’ll be greeted with iced towels, cooling mist spray and homemade fresh fruit ice lollies to refresh. Whether you’re looking for a reviving weekend escape or a longer break to switch off, The Oberoi Al Zorah makes for a perfect getaway.